We among the most trusted firms, indulge in manufacturing, supplying and exporting Sparkler Filter Press. Used in several industries like automobile, automotive and textile, these products are made using quality material and latest technology. Our Sparkler Filter Press is also thoroughly checked by expert quality controllers on various parameters to ensure flawlessness. We further conduct regular researches for improvising these products. The liquid is directed with the help of pumps through the centre channel of the cartridge from the bottom of the body. Suspended particles get retained on the fitter medium resting on the filter plates and the clear filtrate emerges from the side holes of the plates inside the tank and flows out from the bottom outlet. 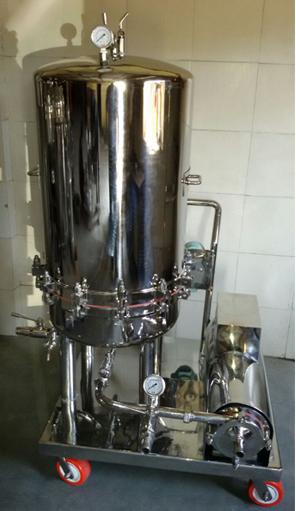 The filter tank does not come into contact with the liquids and hence remains clean. The cake filtrates and solids remain completely inside the fully closed filter plate cartridge. Complete recovery of the filtrate is possible by passing of air or an inert gas through the bottom inlet to dry the cakes and get a clean empty tank. • Available in variety of plate size options. • Comes with horizontal filter plate. • Deliver optimum filtrate quality. • Has large cake holding capacity. • Maintenance can be easily carried out just by lifting the dome i.e., without lifting the cartridge. • Quick and easy removal of filter plate cartridge for cleaning of cake. • Filtrate is obtained without scavenging agents. • Liquid does not remain between the tank or the cartridge. • Possibility of high working pressure. • Uniform distribution of cake and filtrate.